Most Brits associate mincemeat with Christmas – its intoxicating mix of fruit, spices, booze, nuts and mixed peel provide Pavlovian stimuli, stirring memories of cherubic choirs a-caroling, roasted poultry, and the Queen’s speech – whereas I associate it with Easter, because it was always around then that we finally ran out of mince pies. I use the term “ran out” quite deliberately, as mince pies were the kind of thing that, growing up, were considered within the realm of “supplies”, so numerous were they. Every year in early December, my industrious mother would make at least six, but often as many as ten, dozen individual mince pies, fashioned lovingly from homemade mincemeat she had prepared several months in advance. These seasonal confections then proceeded to appear on the table each and every mealtime, during tea breaks, whenever we had company over and any other time people were sat sitting and might be persuaded to have a smackerel of something, until everyone was thoroughly sick of the sight of them. Towards the end of March, the sight of the poor, battered-looking stragglers, that had been taken in and out their box so many times that their pastry shells were all dented and crumbly, was particularly sad. 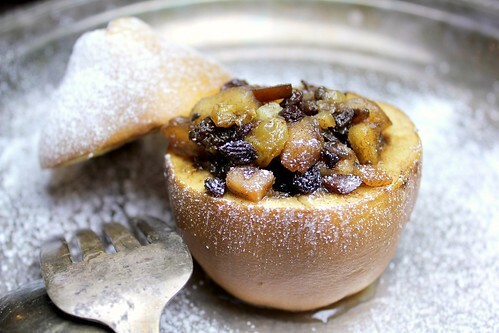 The derivation of the word mincemeat, which today contains no minced meat, is Medieval, from a time shortly after Marco Polo had returned from the East, and every cook worth his salt was finding new ways to disguise and preserve rotten provisions with the spices he popularized. Adding cinnamon, nutmeg and cloves to ground meat, dried fruits, candied peel and chopped nuts before soaking the whole lot in high octane liquor must have been a hit at the time, which probably speaks more to the concurrent lack of fresh meat than to whether this was, in fact, a delicious preparation. Either way, it caught the imagination of a nation, and though the ground meat has largely been dropped, the tradition of using these spices to perfume pie filling continues strongly. Another reason mincemeat was such a hit way back when is because once made, it can be expected to keep, unrefrigerated for as long as 2 years – something my mother bore in mind, as she often made hers over the first weekend of the New Year giving it ample time to “improve” over the next 12 months. Throughout the year, she would occasionally rouse it from its slumbers, turning it over and adding a touch more brown sugar or booze as she deemed necessary. Suffice it to say that by the time Easter came around, and the last mince pies were served, their mincemeat contents was nearing its second birthday, and was so highly perfumed that to inhale deeply close to a warmed mincer was to risk singed nose hairs. Following my mother’s established tradition, I was well prepared, having put together my mincemeat last January, and fed it occasionally throughout 2011, so that it was rich and boozy by the time the Holidays arrived. Unfortunately, the energetic screams of our firstborn put paid to any intentions I may have had of making batches of personal mince pies before Christmas, so I had plenty of mincemeat leftover to ring in the New Year with. Inspired by a desire to produce something that people would actually eat before the next Christian festival hove into view, I quickly prepared this mincemeat stuffed quince. You could quite equally pair it with a vanilla custard/creme anglaise or, as I prefer, a whisky-laced whipped cream, but I lost my dander somewhere along the way and just shook some powdered sugar over it to evoke the wintry season instead. Oven-baked quince are really, really good: rich, almost custardy in flavor and not overly sweet. 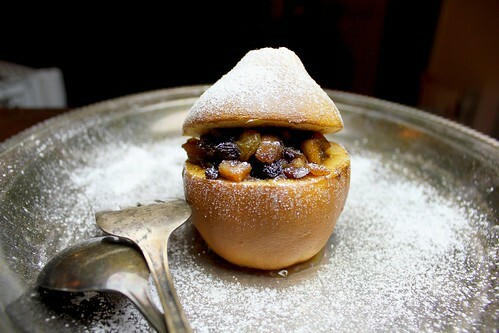 A perfect dessert for the Holiday period, providing enough time is taken between courses. It’s probably not worth making a batch of mincemeat just for this purpose, but they are they dead easy and quick to pull together, and will be eaten in no time, allowing you and your family to leave Yuletide flavors safely behind you before the end of January. Prepare mincemeat according to directions and store in a cool, dark place. Bring to room temperature. Cut quince or apple in two pieces. The bottom should be about two-thirds of the fruit, with the top being the other third, where the stork is. With a paring knife core and empty most of quince or apple flesh, leaving half an inch (1cm) wall around the outside on both top and bottom pieces. Leave skin on. Fill cavity in bottom with mincemeat and pile high. Top with lid and brush fruit lightly all over with melted butter, and sprinkle with brown sugar (latter is optional). Place in oven and bake for 40-50 minutes until quince/apple is nicely browned and wilting but not collapsed. Allow to cool for 5 or 10 minutes before serving dusted with powdered sugar, and with your choice of seasonal sauce/whipped cream/ice cream. That does look good, but where did you find quince? I haven’t seen it in ever so long. I haven’t made mincemeat in years and years but it does look awfully good on that plate with its snow covering of sugar. I just had a bit of Christmas pudding and love all those flavors. 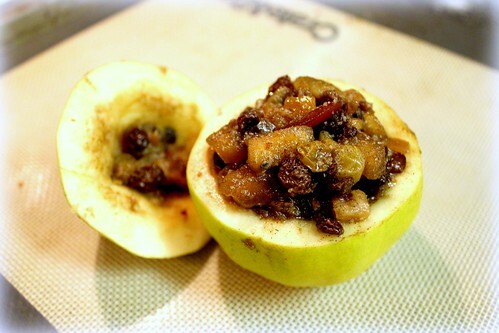 Perhaps I should find a good solid recipe for mincemeat… hundreds of years old and then find a quince or 2!! A little bit of nostalgia for you and education for the rest of us. Love the presentation with the powdered sugar. Great job. Best wishes to you, Amy and the little one for 2012. Hi, Deana. Luckily our local grocer carries quinces this time of year. And we totally recommend Delia Smith’s mincemeat recipe – it’s tried and true! Stuff it into another fruity if you can’t find quince. Joan – thank you so much! I (amy) have made a resolution to try and blog a bit more this year. Ok, alot more. So nice and wintery. I like the powdered sugar finish, and it’s heart healthy too, unlike whipped cream would be. Sounds like the perfect ending to a holiday meal. Best wishes for a happy healthy 2012. P.S. I noticed your blog on Zite a little while back, congrats!! A very tasty recipe thanks.